Posted by Landry Shorkey on October 7, 2018 in News. 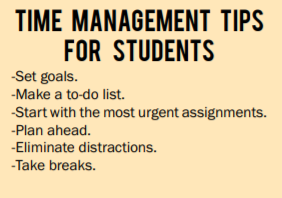 Managing schedules can be one of the most difficult aspects of college, but there are methods that students can use to help stay on top of their deadlines. For many Bulldogs, like Ferris business administration senior Eric Chase, jobs take up a major part of their week, adding one more thing to their plates and making it harder to keep their lives balanced. “Time management is really big in my life because I’ve worked full-time throughout all of college … I thought it was really challenging to work full-time and go to school full-time, but somehow I did it,” Chase said. For Ferris communications senior Taylor Hartfield-White, a shift at work can signal the end of the day and sap motivation to do homework after. Different methods work best for different individuals, but popular time management techniques include using a planner and cellphone apps such as notes, reminders and calendar. Procrastination is a common struggle that college students face. Sometimes, grades can be negatively affected. “One of my papers I had for three weeks, and I did it the last week before it was due. I mean I still got, like, a C-plus, but I could’ve done better if I used my time wisely,” Ferris elementary education sophomore Gabrielle Dobroczynski said. With constant distractions such as clubs, sports and parties, priorities can easily become shifted. Ultimately, Hartfield-White said, it is important for students to remember that college is about their education.